Doughnuts are one of the first things that spring to mind when thinking of American food. Although the exact history is unclear, they are generally believed to have first been made in America in the early 1800s. Doughnuts are so popular in the US that the first Friday of June each year is National Doughnut Day! They can be made in rings or in balls which are then stuffed with jam, cream, custard or other sweet fillings. Here we give a recipe for balls. If you can’t get hold of fresh yeast, use half the amount of instant yeast. Doughnuts are delicious when filled with jam – try strawberry or raspberry – or custard – vanilla and chocolate both work really well. Spoon your chosen filling into a piping bag, make a small incision in the doughnut and squeeze a small amount of filling inside. 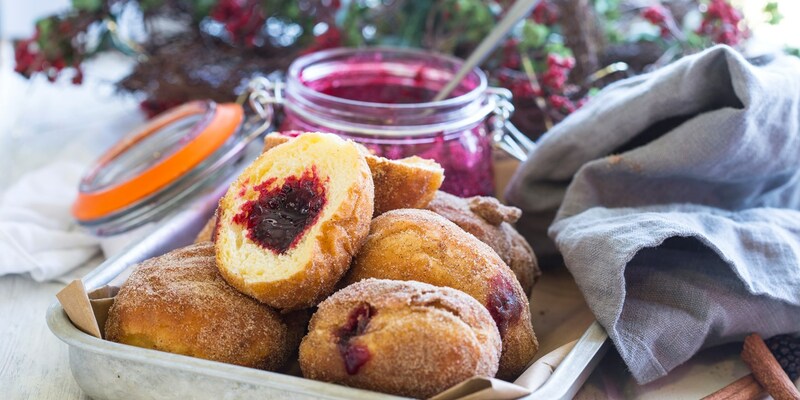 You could also try flavouring the sugar to roll the doughnuts in; citric acid gives a great tang to the outside of the doughnut or try grinding up freeze dried fruits and adding them to the sugar to complement the jam used inside. Dried herbs such as thyme and rosemary also give a great extra flavour to the sugar as does vanilla. Adding the zest of a lemon and a lime to the batter makes a really fresh-tasting doughnut. You could then fill them with lemon curd for an extra citrus hit. Doughnuts are a lovely treat served by themselves – try Dominic Chapman’s Strawberry doughnuts – but they can also form part of a dessert such as Paul Ainsworth’s creative Taste of the fairground. Adam Gray adds cocoa powder to his dough and serves his chocolate doughnuts recipe with a damson fool for an autumnal dessert.